PCEvaluate, founded by Stephen O’Donnell, one of the UK’s best known online recruitment experts, launched today to bring the ‘PeopleClues’ suite of online psychometric assessment and profiling tools to the UK, to enable employers to improve their recruitment processes, and end the crippling costs of hiring the wrong people. “Employers are now being swamped with huge volumes of online applications, which all have to be handled professionally. Mis-employment, where an employee is recruited to the wrong job, can do real damage to any company. Employees in this position are not only under-productive, but also have a negative effect on everyone they work with. As the economy recovers and employers are hiring again, misemployment has a significantly detriment effect on their bottom line,” explained Stephen O’Donnell. 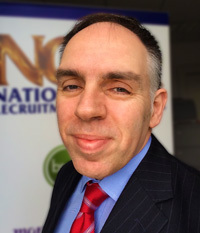 Managing Director of PCEvaluate (www.PCEvaluate.com) and Founder of the National Online Recruitment Awards (www.norauk.com). A recent study, by the economics consultancy Oxford Economics, found that each member of staff that leaves costs an employer an average of £30,614 to replace. Most commonly cited as the reasons for people leaving employment are that they were unsuitable for, and unhappy in, their job. Additionally, employers are experiencing monumental growth in the number of applications for every vacancy (APV); up to an average of 120 APV in some sectors. Using psychometric profiling to assess a candidate’s ‘attitudes’ for a particular role is already well established across all business sectors globally. Until now though, accurate psychological tools have been expensive to implement and largely shrouded in ‘psycho-jargon’, which requires costly consultants to interpret reports. However, the PeopleClues assessment toolkit, which powers the PCEvaluate online solution, simplifies the entire process, reduces the cost significantly, while maintaining accuracy, and has been certified by the British Psychological Society. PeopleClues is used extensively in the USA by global corporations, such as Marriott Hotels, Burger King and Wendy’s, and is now being introduced to the corporate market in the United Kingdom, where Random House Publishing / Penguin Books are already a client. With PCEvaluate employers can assess a candidate’s Personality, Cognitive Ability, Attitude and Engagement both with the role and the company. They can use a wide range of built-in personality ‘benchmarks’ to ascertain a candidate’s ‘job-fit’ for the role, or they can create custom benchmarks based on the personality types of existing successful employees, so that they know what to look for in job applicants. PCEvaluate can also provide jobseekers with their own copy of the attitudinal report which they can use for career planning and in their CVs and applications. To trial the system for yourself please contact Stephen O’Donnell directly.